"The elins have one driving goal: if it’s not good for nature, stop it. Older and wiser than they appear, they join with forces of nature and mortal races to sweep their enemies from the battlefield. Their speech is often dark, forthright, and otherworldly, and their sense of humor can border on vicious. Other races find the elins' manner and behavior off-putting." Regardless where they live, the elins will not tolerate anything that goes against nature. Popolion will be the first stop at peace. "Building corporeal forms around tiny fragments of her own divine being, the goddess Elinu created the elins. Their physical appearance reflected the youngest daughter of Arun's naïve desire for beauty and peace. An elin queen governs both the elins and the poporis, with whom they share a history and a mission. The queen and her forces have proven their wisdom and diplomatic prowess in peace, and their tactical and fighting prowess in war." "Both the elins and poporis champion the cause of nature, but the bond between them is deeper than that. As a single nation they repair, protect, and preserve the world they live in and love above all else. The popori nation was among the first to join the federation. Recognizing the Argon Invasion to be a threat to all nature, the elin queen promptly rallied all of her forces, popori and elin, to the cause." The emblem that once used to belong to both popori and elin. 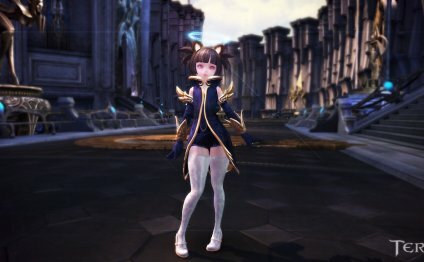 Elins are by far the most censored race of compared to TERA Korea. They changed greatly when localized to the United States and Europe due to politics.